Team Building Training Materials are designed for trainers to develop high performance teams in the workplace. Confidently train employees and managers the four stages of team development, team shaping factors, leadership and more! 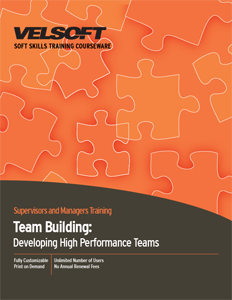 Seeing is Believing This sample manual to teach Team Building: Developing High Performance Teams is in MS Word format. Success as a manager can often depend on how well the team operates. How are their problem-solving skills? Are they enthusiastic and motivated to do their best? Do they work well together? There have been hundreds of studies demonstrating that human beings function better and learn better in groups. If participants want to develop their team leadership skills and unleash the talent of their individual team members, Team Building Training Materials is a practical look at current leadership practices that work. Want to see what topics you will cover? Check out the Team Building Course Outline!